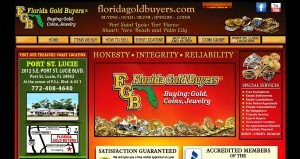 Florida Gold Buyers address, phone, website, hours of operation, and more. The Florida Gold Buyers reputation is impeccable, with over 100,000 people served throughout Florida and well over 50,000 people served on the Treasure Coast. Despite helping over 100,000 customers throughout Florida the Florida Gold Buyers have maintained a perfect rating with the Better Business Bureau. Honesty, Integrity and Reliability is our motto and we live up to it. 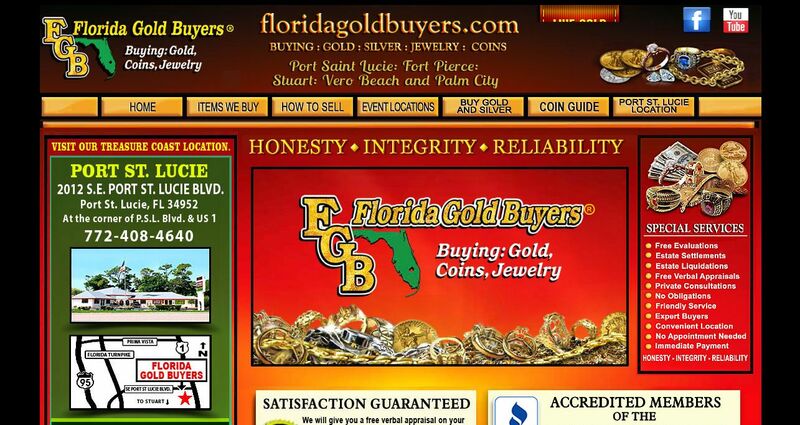 Few other buyers on the Treasure Coast have helped as many customers as us, and few other buyers have maintained a perfect record with the Better Business Bureau like the Florida Gold Buyers. The Florida Gold Buyers specialize in buying Coins, Rare Coins, Certified Coins, Coin Collections, entire Estates, Silver Coins and Gold Coins. Don’t let other companies that advertise that they buy Coins rip you off and only pay you a fraction of your Gold and Silver Coins worth. Most places you go to will never tell you “you have special coins” because they only want to buy them cheap. The Florida Gold Buyers will pay you what your Coins are worth and even publish a guide to help you determine your true Coins values.